Welcome to Mango Sports co., limited MANGO SPORTS supplies the following three artificial grass systems: Sports system Leisure system Professional golf green Sports series: soccer, football, basketball, hockey, tennis, gate ball, golf, volleyball, bowling ect. Landscaping series: gardening, landscape, residential courtyard, gardens, public places, commercial and Where you can imagine. 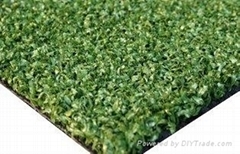 Golf green :putting green, indoor practice putting green, putting mat ect Our artificial turf production quality has the following standards： Manufacturing Quality Control and Management Environment ISO9001:2008 ISO14001:2004 Standard U.V. Resistant ISO4892-3:2013-1 (by SGS - U.V. 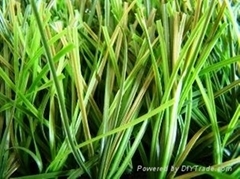 test) ISO105-A02:1993/Cor.2:2005 (by SGS - U.V. test) European Standard EC Council Directive 2009/48/EC Sport Grass Lab Test - FIFA ISSS SSTL-CAA ECUST (by Sport Surface Testing Laboratory - Test Method: FIFA QUALITY REQUIREMENT - "Test Methods and Requirements for Artificial Turf Football Surfaces") Fire resistance DIN51960 Class 2 Flammable Chemical Test RoHS Directive 200/95/EC (by SGS - Lead free, Mercury free, Cadmium free and free from other 24 chemicals...etc) MANUFACTURING & ENGINERRING With over 9 years experience of manufacturing ,the UV-stabilized and Color Fastness of the products is 100% guaranteed. We guarantee the materials to be offered 100% virgin. Our sophisticated and experienced engineer makes new improvement of products anytime and also development according to buyers request. EXPERIENCED SALES TEAM We provide customs declaration,air shipment ,maritime shipment,FORM E application, EN testing report,certificate of origin,trade mark registration, and all necessary Document as your request. We can arrange your schedule in china,including your hotel reservation ,air ticket reconfirmation,factory workshop visit,new product introduction,technical training and even detail travelling information inside China.